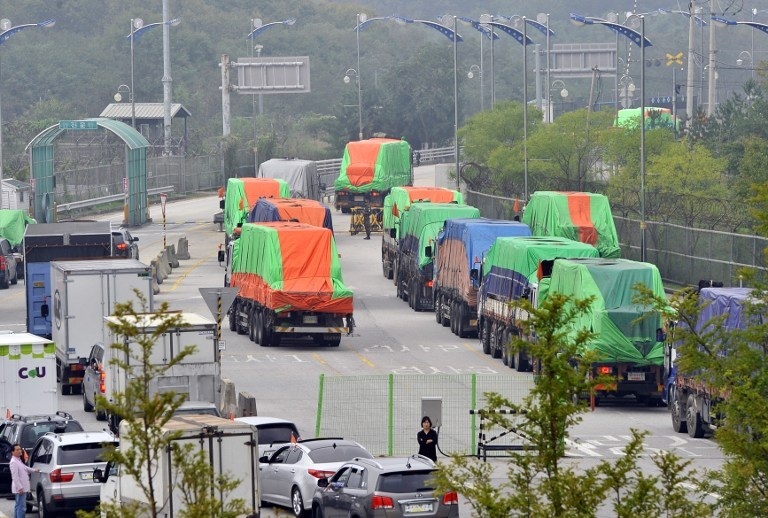 South Korean trucks delivering aid cross into North Korea, Sept. 21, 2012. Counterfeit versions of medicine donated to North Korea by the United Nations and international aid groups are flooding local markets as producers seek to capitalize on the shortcomings of the country’s crumbling health care system, according to sources inside the reclusive nation. North Korea’s regime claims to provide its citizens with “free universal health care,” but a lack of basic pharmaceuticals in the country has led to the practice of corrupt officials pocketing medicine donated as foreign aid—mostly from the U.S. and South Korea—for resale to the public through local markets. The drugs are known as “U.N. medicines” to disguise where they come from, since customers fear being labeled as “reactionary” if they are caught with goods from North Korea’s archenemies, and while expensive, are significantly cheaper than similar ones produced in neighboring China. But according to sources in North Korea, counterfeit drugs produced in the country with similar packaging and markings are increasingly found in local markets, damaging the health of some customers and seriously undermining trust in pharmaceuticals donated as foreign aid. “There are too many fake ‘U.N. medicines’ [at local markets] and now North Koreans can’t trust them anymore,” a source from North Hamgyong province told RFA’s Korean Service during a recent trip across the border into China. “The packaging, containers, drug instructions, and even the shape of the fake medicine look the same as for real ‘U.N. medicine,’ so they are often mixed with real ones for sale at the markets … Not even doctors can tell the difference before actually taking the drugs,” said the source, speaking on condition of anonymity. Drugs used to treat tuberculosis, digestive problems and pain were among the most commonly counterfeited medicines, the source said, adding that wealthier citizens have been asking people traveling to China to purchase pharmaceuticals there and bring them home. A second source in North Pyongyan province, also along the border with China, said the counterfeiting of medicine is so prolific in North Korea that the practice must have powerful backing. “It is true that there are a lot of fake medicines being sold [in local markets],” said the source, who also declined to be named. The prevalence of fake drugs in North Korea has also led to medicine increasingly making up the bulk of what traders and smugglers bring across the border for sale from China, the sources said. They said many of the medicines brought across the border include drugs clearly marked as having been produced in South Korea, meaning that traders and smugglers are forced to be extra careful when passing through customs to reenter the North. North Korea received U.S. $21.3 million in humanitarian assistance from the global community in the first six months of 2015, according to data compiled by the United Nations Office for the Coordination of Humanitarian Affairs. By type, food and nutrition aid topped the list at U.S. $9.64 million, followed by health care at U.S. $6.2 million, and the supply of drinking water at U.S. $2.4 million, it said. Medicines are in high demand in North Korea where, by the government’s own account, “more than 80 percent of village clinics suffer from chronic shortages of medicines and supplies at all levels of the system,” according to the Associated Press. Seizure of donated aid by North Korea’s elite has been a key point of debate in the international humanitarian community, with some groups arguing that assistance should not be sent if it goes to the authoritarian regime’s most privileged members. But others have argued that even if the elite benefit the most from the donations, some of the supplies will leak out to reach other segments of society, providing some marginal benefit to the larger population. Reported by Joon Ho Kim for RFA’s Korean Service. Translated by Ahreum Jung. Written in English by Joshua Lipes.